I’m from Kentucky, a state which, when people think about it at all, conjures up images of rednecks, moonshine, and Hee-Haw. But I grew up in Lexington, the second-largest city in the state, which is made up almost entirely of suburbs—there’s no sense of “country” heritage, no accents, and (until well after I left to make my fortune in the world of professional nerdery) almost nothing to distinguish it from similar cities in the Midwest other than the fact there were horse farms nearby. I’m from Kentucky, but there’s been very little in my life that clearly marks me as a Kentuckian other than two things: a love of bourbon and the fact that my dad has met Colonel Harland Sanders. Colonel Sanders is the mascot of Kentucky Fried Chicken, and is enjoying a bit of a renaissance, thanks to the fast food chain employing a variety of comedians and actors to portray the white-suited, goateed gentleman who was as Southern as Scarlett O’Hara in Gone With the Wind. I’m sure some of you might be surprised to learn that Sanders was a real person—he created the restaurant and the recipe of “11 herbs and spices” that made it into a worldwide chain. And he really did wear that white suit and have that white goatee virtually every day or his adult life. Like me, my dad Leonard Bricken grew up in Lexington; he was born in 1951, a year before Sanders would license his first Kentucky Fried Chicken restaurant in Utah, turning the real-life Colonel (although I should mention his “colonel” title was an honor granted by the state, and not a military rank) into a very rich man. In a few years he had franchised KFC restaurants across the country and found himself in charge of a burgeoning business empire as opposed to a single restaurant. Sanders would eventually sell the chain in 1964, having grown beyond his capacity to manage, but our story takes place in 1957 or so, when the Colonel was still was on the rise. He still lived in Kentucky, and could be seen throughout the state, basking in his status as a local legend and fried chicken magnate. My dad would have been six years old or thereabouts, and as he tells it he would often be dragged downtown by my no-nonsense grandmother when she did her shopping. He was mainly miserable because Gran (as I knew her) was shopping mainly for boring, functional items like clothes—but eventually, tired of vocal misery, Gran would drop him off at the Citizens Union Bank building, where my great-grandmother worked, and where his day brightened considerably. Here’s where my story gets exceedingly ‘50s. Because his doting grandmother would treat my six-year-old dad to a delicacy scarcely to be believed—a bottle of Coca-Cola. Which was purchased for five cents. At the drug store down the street. You may recognize a variation of this scene from oh, pretty much every TV show, movie, comic, etc. about kids in the ‘50s ever. But it’s a cliché because this actually happened everywhere, all the time. My great-grandmother would walk my dad to the McAdams & Morford drug store, which had a tiny lunch counter at the back, as was the custom at the time. And she would buy my dad a Coke—“so cold it hurt your teeth” he says—and my dad was in bliss, scarcely able to imagine a greater delight. That is, until the day he met Colonel Harland Sanders. When my dad and my great-grandmother walked to the drug store, they passed in front of the Lexington courthouse, which Sanders was exiting. Although Lexington was a reasonably sized town, it was still the ‘50s, so everybody knew everybody, including the Colonel. He walked over to my great-grandmother and said hello, it being the polite thing to do. My dad froze in terror. When my dad first told me this story, he stressed that Sanders was huge; a brief Google check says that Sanders stood 5’10”, not that impressive, but certainly he would have towered over my pint-sized dad, who quickly ducked behind my grandmother’s leg as this strange, ominous man in white approached the two of them. My dad was certain that this scary, unearthly ghost-clown-man was going to kill him, or eat him, or some kind of combination of the two. He remembers being unable to look at Sanders, because he was just so scary. Which proved to be a problem when my great-grandmother introduced her grandson to the Colonel… and the Colonel leaned down over my tiny, frightened dad. My dad ran away. As fast as his little legs would take him. He doesn’t remember what happened after that; I’m certain he’s repressed the memory. I’d like to think my great-grandmother still bought him that bottle of Coke, assuming she caught up to him. This wasn’t the last time my dad would see Colonel Sanders; he appeared in Lexington with some regularity, but even as he grew up, my dad went out of his way to avoid conversation with the man. And every time he did spot that white suit and white head of hair, a shudder went down his spine. I cannot verify this story; records are spotty, and if Sanders himself made note of the incident, he did not include it in his again totally-real autobiography Life as I Have Known It Has Been Finger-Lickin’ Good. But I tell you this: my family has on several occasions bought Kentucky Fried Chicken, and even my father ate it, because it is delicious. 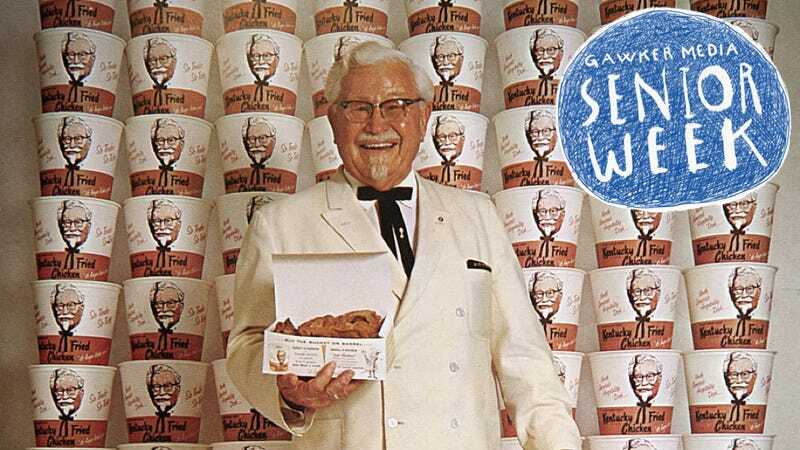 But if the Colonel’s face was staring at him from the side of the bucket, my dad would always turn it away before he ate a bite.